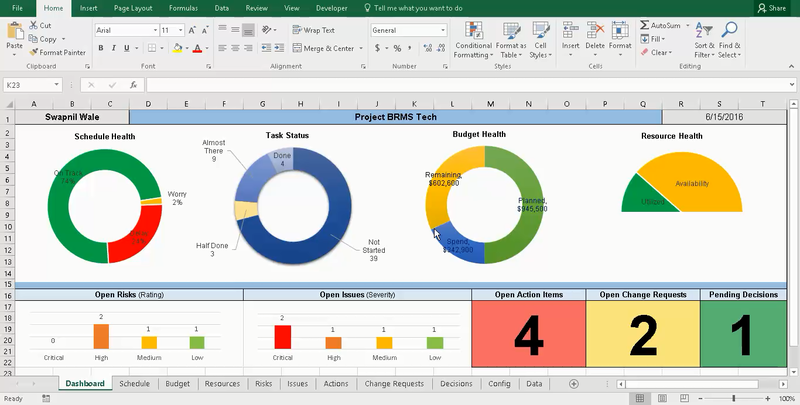 A Project Status report is one of the most powerful tools available to a project manager. The status report is a passport out of trouble for the project manager because by sending the status report he is making everyone part of the problem. A crucial tool for any project manager as it captures all the critical aspects of a project - Budget, Schedule, Risks, and Issues. Most of the companies or business prefer a weekly report, so it forces the project manager to gather the status - its acts like a checkpoint. Keeps the team and stakeholders informed about the current project status. Also, a chance for a project manager to make sure everyone is on the same page. The project status template Allows the project manager to highlight critical risks and issues. Even though a lot of people ignore the status report a PM would have played his or her part by providing everyone the details. Helps in setting an expectation for resource dependency as you can articulate what type of resources you need. Used in team meetings or other meetings as a starting point for discussions. Let's see how you can make your status report useful and informative. 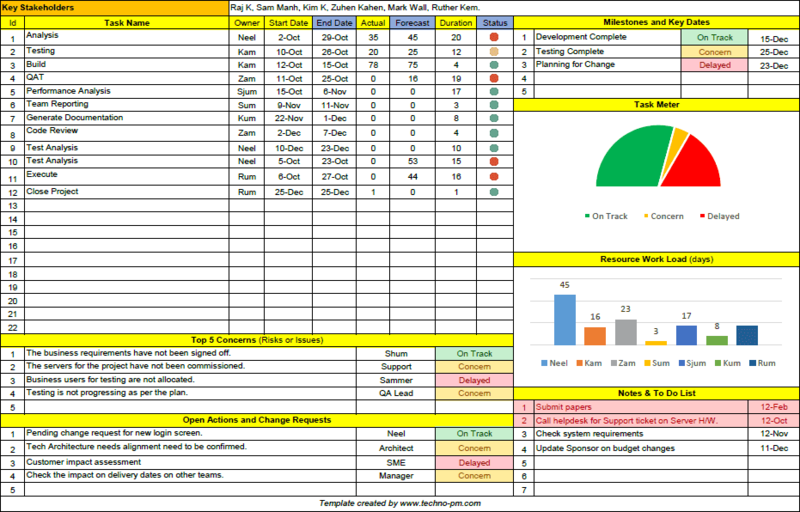 The critical point with the status reports is to be able to keep it within one page. Keeping it limited to one page makes the report more readable and easy to update. It is essential that a project status report covers the critical parameters of a project. I have used Microsoft Word, but you can use whatever document format you prefer. I have divided the report into 4 sections. Project Details and Summary Update, Project Key Parameters, Project Schedule, and Risks/Issues. The first section of the project status report template contains the necessary details and a brief summary update of the entire project. The necessary details include information like Project Name, Project Manager, Project Status Date, and optional project code. The status date should be the date on which the report is being drafted. It is very important to put the right date in as it will give you an idea about the project status at that point in time. The summary section is one of the most read parts in the status report. You have to make sure that you write a brief and crisp summary. Make sure that you do not write too much content as people will not read long paragraphs. The summary should be targeted towards giving a glimpse of activities that have happened in the last week. You can use the summary to convey both good and bad news. Please see examples in the picture above. You can add any additional fields as you wish to the project status report template. Example 1: The project is facing significant delays due to defects identified in the quality assurance. The team is working on fixing the issues. The project budget is estimated to run over. The project schedule still remains in on track. Example 2: The vendor has indicated that the delivery of the product is on track. The internal project team is ready for analysis. The project schedule is a concern due to the unavailability of infrastructure. The critical project parameters within the project status report template contain the essential aspects of the project. Each parameter can have 3 statues - on-track, delayed or off-track. On-track means everything is fine, delayed means there could be some delays but still under control and off-track means that aspect of the project is way off and needs immediate attention. Generally, the status of a task or project phase should be marked delayed before it is marked as off-track. It is essential to use the delayed status early if you see an issue. The schedule is the planned dates as per the project plan. Quality refers to the testing phase and in general, refers to the overall quality of the project. The scope is a gauge of project deliverable. Budget is the financial aspect of the project. Risk and Issues will tell the stakeholders if the risks and issues are currently manageable or not. There is a comments column for each of the parameters. The comments can be used to provide a brief explanation of the current status or can be used report numbers like % complete, defects open, current spend etc. 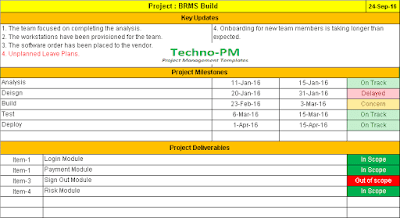 The project schedule section with the project status report template can be used to display the key project phases or stage gates. You can display the project timeline or individual project phases with start date and end date with % completion in a tabular format. Please see an example. I prefer to show the summary tasks in the project plan with their basic information. It is up to the project manager to decide how he or she want to report on the schedule. Generally, the senior management of the company will always look at high-level dates or milestones rather than getting into the details. You should use whatever the project team is familiar with. You can always copy paste this information from your project plan. The project schedule is important as the project team needs to be aware of the key dates that the project must meet. The project status report template contains a section for project risks and issues. This section enables a project manager to highlight the key risks and issues. The project manager should avoid adding all the risks and issues as it will make the list too long and readers will not get a clear idea. It is always a good idea to add only the top 3 or 4 risks and issues. At times you can also add the current risk or issue which is of high severity. You can also add what possible mitigation you can have a separate line in the risk/issue description. The owner of the risk or issue is a person responsible for some action item to mitigate or address the risk or issue. The risk or issue status will be open or close. It should be open when the risk or issue still needs to be looked at. It should be closed when the risk or issue has been addressed. It is a good idea to leave the risk in closed status for a couple weeks in the report so that people can see it is closed. If you remove the risks or issues immediately after closing people will never notice a certain issue was addressed. You may choose to move the closed risk at the bottom of the list. After having populated different sections your project status report will look similar to the image on the right. As mentioned earlier the key here is to keep the status report short and crisp. You want your team and business stakeholders to read the report every time you send it to them. 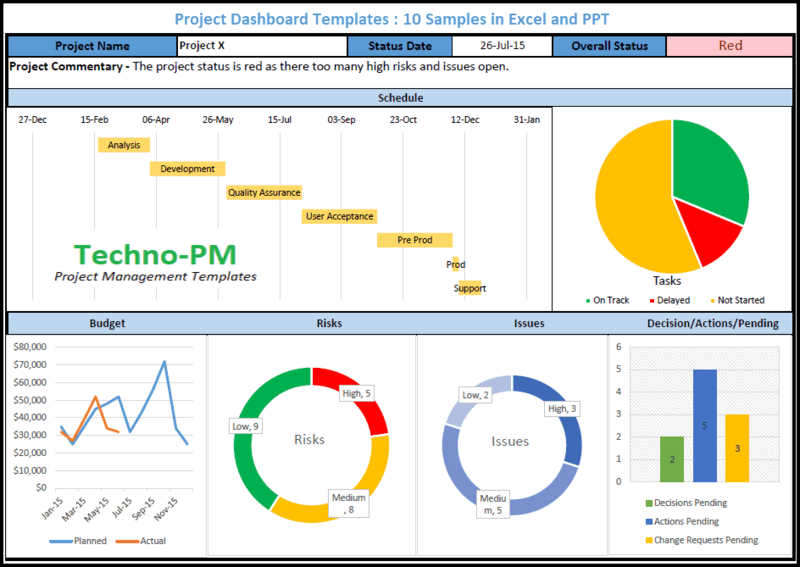 Generally, most of the project managers send a weekly status report to the team and stakeholders. Sending regular weekly status reports will ensure that everyone is aware of the current status of the project. 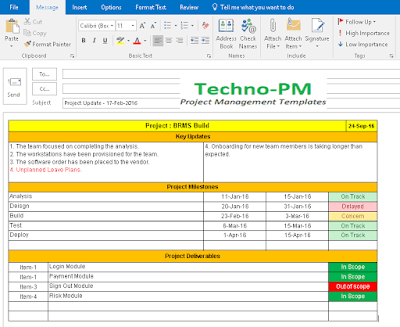 It also a good practice to copy the project parameters section in the email which will have the project status report. You can change any of the sections you wish to. Also remember that you should send the status report to everyone involved with the project including the stakeholders, team members, senior management, vendors, clients as applicable. Not all projects need a complex status report which has all the KPI. Sometimes you need a simple status report which can help in conveying the required message. 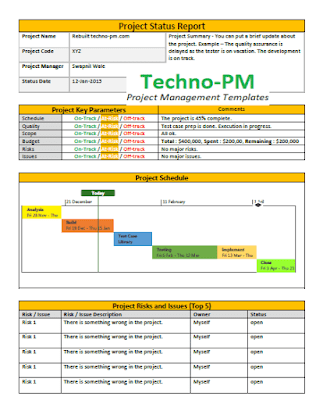 In this article, we will look at two simple versions of project management status reports. The report contains 3 key sections other than the project name and date. The 3 key sections are - Key Updates, Project Milestones, and Project Deliverable. Project Milestones section will contain key project milestones and their status. The status can be On Track, Concern or Delayed. The key updates section is a free-form update of the latest project news. It has been divided into two parts to allow effective use of space. The last section is project deliverable. This section will have the project deliverable listed with the reference number and scope indicator which indicates if the item is still in scope or out of scope. The status report is divided into 3 sections. The first section is project news. This is meant for general project updates. 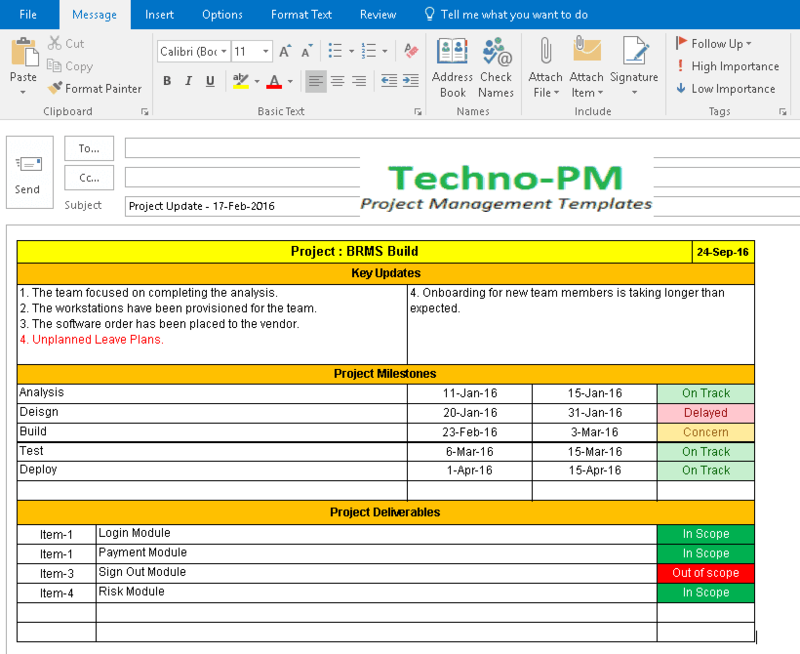 The notes section allows a project manager to highlight general updates or issues. The notes can be in 3 categories - FYI (informational), Hold Up (blocker) and Issue (when there is some issue). Techno-Tip: The templates are concise and can easily fit into an email for updates. See below.